AlJNN 15 July 2014 Libya is considering a deployment of international force to re-establish security amid a flare-up of violence in Tripoli which saw dozens of rockets destroy most of the civilian aircraft fleet at its international airport. “The government is looking into the possibility of making an appeal for international forces on the ground to re-establish security and help the government impose its authority,” a government spokesman, Ahmed Lamine said in a statement. The statement comes after deadly clashes led to the closing of the main international airport in Tripoli on Sunday, which came under a renewed rocket attack on Monday. According to the country’s government at least seven people have been killed at the airport since Sunday, and around 90 percent of aircraft parked at the hub were destroyed or made inoperable. The control tower was damaged as well as several Grad rockets struck the transit hub. “Dozens of rockets were fired at the airport,” Al-Jilani al-Dahech, a security official at the scene, told AFP, while another source said one aircraft took a direct hit. 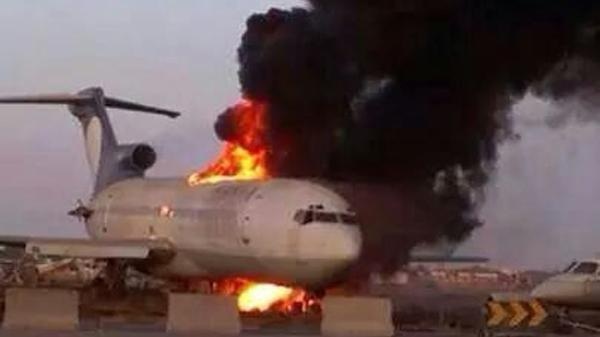 Libya’s main carriers Afriqiyah Airways and Libyan Airlines were damaged in the fighting, a security official added. At least two soldiers were killed and a number of planes were damaged when a militia shelled the airport on Monday, according to a Libyan soldier who spoke with Reuters. “Several planes and cars belonging to citizens were hit,” said Abdel Rahman. A hall used by customs controls had also been hit, he added. On Monday Libya suspended all flights to and from its third city, Misrata, which is tied to Tripoli airport for its operations, while Benghazi airport has been closed since May. “The headquarters for the entire western region is at Tripoli airport, and following its closure, Misrata airport also has to close,” said the official, speaking on condition of anonymity. “Libya is now practically cut off from the outside world,” a source at Tripoli airport told AFP. Only two tiny airports are now operating at Bayda and Tobruk in the east of the country. The fighting in Tripoli escalated to a new level on Sunday when clashes erupted between Islamist militant groups and militias from the southwestern city of Zintan. At the root of the recent feud lies the country’s June general election, marred by fraud allegations. The country was left in a power vacuum since the 2011 overthrow and killing of long-time strongman colonel Muammar Gaddafi. Meanwhile, medical sources told Reuters that at least six people were killed and 25 wounded in Benghazi as fighting between security forces and rival clans continue since late Sunday. The security situation is so tense that the UN mission in the country announced the temporary closure of its activities. Libya’s neighbors Algeria, Chad, Egypt, Niger, Sudan and Tunisia issued a call for dialogue on Monday, urging to set up twin commissions to broker talks and prevent any spillover of violence into the neighboring region. This entry was posted in AFRICA and tagged African Airlines, Afriqui Airlines, international airport, Libya, Planes Burned, Tripoli airport, Tripoli Airport Attack. Bookmark the permalink.